They took Pak Samad away from his home during the wee hours, too, and then incarcerated him for 5 years under the Internal Security Act. But that was 40 long years ago. Don't take us back to those dark ages, IGP. I am in 100% agreement with you on this one. Park the political motivations aside, there was really no need to mistreat this man. "Hardly something that called for his arrest at his home at 4.30 in the morning, or bundling him away for questioning 300km away in Johor Baru." Not a victory for either common sense or for PDRM's image. I've long... had the feeling that the government, especially the Police, dare only to take drastic action against the Malays. Memali was the best example... i.e... to diffuse and to deflect media attention away from communal antagonism, then. Wonder why the Police did not do a Sidek Kamiso's on Jeff Ooi? Anyway... when was 'air-jampi' being associated with Islam or Prophet Muhammad SAW? 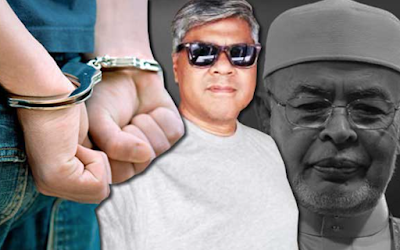 "Former journalist Sidek Kamiso revealed the police tried to provoke him by asking about his religious beliefs and political leanings after arresting him on Monday. "They asked all kinds of questions to rile me up." 5 cops at midnight to harass one unarmed woman in post-natal confinement.